Create your own rustic display with your favorite candles and candle accessories from The Red Brick Cottage. We have dozens of holders, hangers, hooks, fillers, adhesives and more for candles of all sizes and shapes. Display jar candles, tea lights, votive candles, pillar candles, dipped candles and many more, safely, anywhere in or around your home. Candles have been used for hundreds of years, first as a principle light source and now as a gentle, warm, festive or romantic decoration. Their dramatic orange glow sets off décor at any time of year and can be used outside in the summertime during fireworks and campfires, or inside while carving pumpkins, hosting Thanksgiving dinners or decorating for Christmastime. 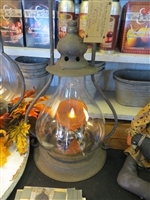 Our candlesticks, holders, lanterns, jar fillers, hurricane glasses, wreaths, sconces and more help you bring in candles of all sizes to your everyday rustic décor, and keep them safely contained anywhere. See our candle accessories collection to find the perfect piece for your seasonal display, dinner centerpiece, or any corner that needs a little pizzazz. Order online or visit our store for even more accessories.